The Queen's granddaughter Zara Phillips and her husband Mike Tindall attended the Magic Millions Raceday on January 14, 2017 in Gold Coast, Australia. Don't see anything nice in that kind of hats. Oh it is nice - for carnival. Why is she wearing that alien thing on her head? It's not elegant at all. No it is not. To be a hat headpiece needs to have at least 10 cm2 base, this has not. It is just a (stupid) fascinator. Well.....well ummm......nope I've got nothing to say! That looks absolutely ridiculous. The dress is ok, though not outstanding, but the shoes and the hat are beyond silly. Elle a simplement envie de rire ! J'aime beaucoup les chaussures mais pour le chapeau, hum hum, je préfère m'abstenir de commentaires et ça, ça dit tout ce que j'en pense! Elle voulait faire concurrence au fascinator de sa cousine Beatrice lors du marriage de Will & Kate!! I don't know what's happening here because not only Zara but also another lady has weird thing on her head. 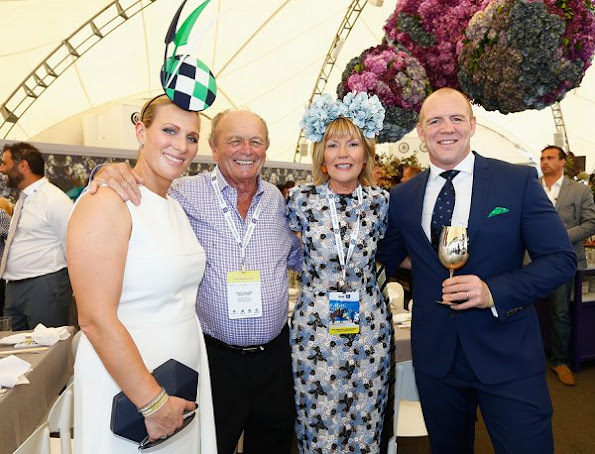 The lady next to Mike Tindall forgot her fascinator -or hat- and decided two hydrangeas from the flower setting, where the couple had just had their picture taken, would suit her just fine! Quelqu'un sait ce qui s'est passé avec le blog "Noblesse et Royautés" de Mlle Salens? Moi aussi j'ai des problèmes. Les articles sont brouillés mais lisibles. Le site fonctionne trés bien en France.Désolée ! What has Zara got on her head! The hat is really the last thing from being classy and royal. Can you imagine the Queen wearing something like this? 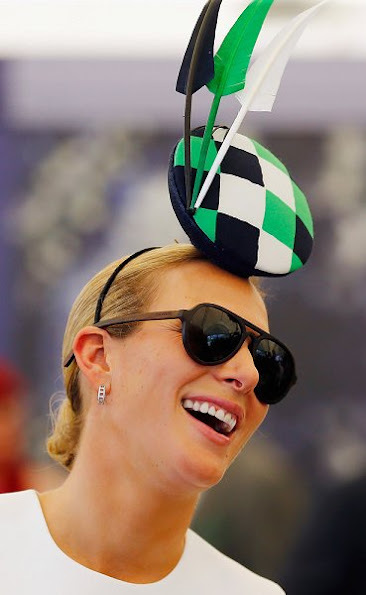 So although the hat is really awful, it is very nice to see Zara smiling and having a nice time after their loss. 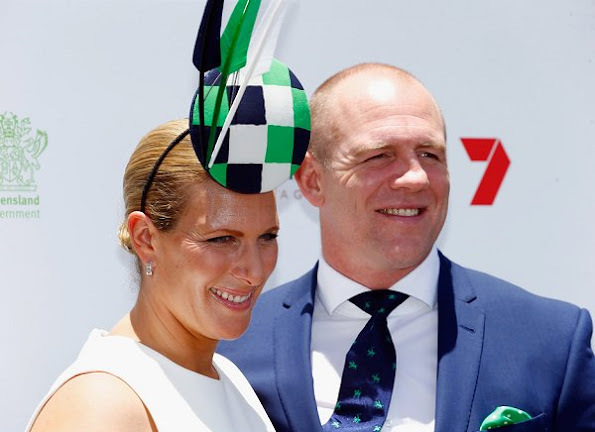 The Australians wear very bizarre hats to the races. 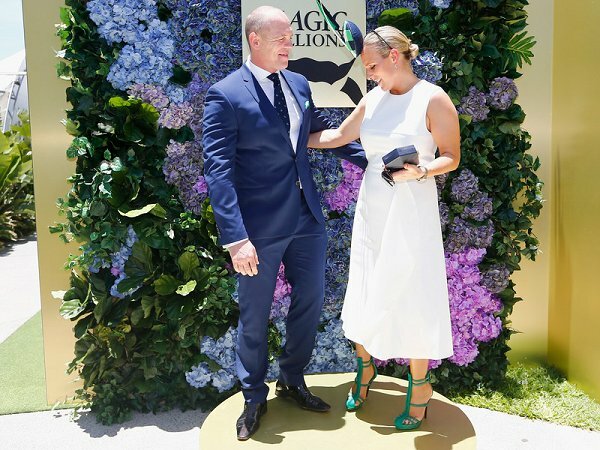 I follow some ladies on IG who are the "wives" of Melbourne and there is nothing classy about the clothes or hats for the races. It almost seems like it is required to have the most tacky hat. Very avant garde styling. Everything seems dumbed down now. When I was growing up there the races were an event where high fashion was worn. Now it's trashy. And the English race events seem to be the same, from what I see online. So if it's a parody of fashion [whether intended or not] I guess it doesn't matter what you wear on your head. Yes, it seems that she hasn't lost her sense of humour, and that's something positive in her situation. The thing on her head, whatever it's called, is just stupid. What's worse is to choose to actually wear it. In the Australian sun a wide brim hat would have been a better choice for Zara. As for the lady with the Hydrangea flowers, all I can say is there is the proof, that is what happens when you stay out in the sun for too long! The "hat" fits the occasion. Zara needs something to cheer her up, good to see she is laughing and I actually love the colours of the "hat". Something different and out of the box!!!! 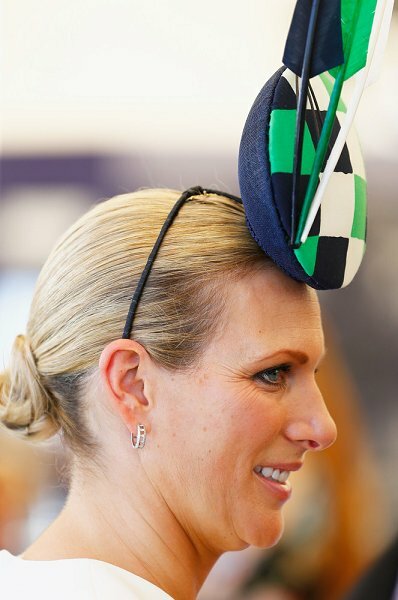 Sorry but its not flattering hairstyle for Zara Tindall (a'la CPss Victoria) but she kinda carry out her target hat and it suits her. And its so good to see both of them smiling. Its been difficult time for them...but life goes on, you have to make peace with what was lost and be grateful for what remained. Zara often has strange hat choices; am glad to see, though, that as said, they are out enjoying life, bless them. I actually like the colours and the pattern. I could imagine the style working very well would it be a plain side placed/tilted fascinator instead of this bowl-with-a-tap-glued-to-the-forehead solution. Zara seems like such a nice person. Just wish she could find a stylist to help with selections. Mike could use one as well. The Queen has such elegant taste, weird that none of her granddaughters were influenced by her in that area. Given what she has been through over the last several weeks, I think she looks amazing. I certainly didn't look like - much less in public - after my loss. She looks darling and she's having fun. I'm happy for both of them, they are a handsome couple.